Meet Max, the Human Skeleton Model with Painted Muscle Origins and Inserts from 3B Scientific. Max has all of the same quality features as the original 3B Scientific Human Skeleton with the added benefit of having a painted on muscle structure on his entire left side. These added details help show the natural structural relation between the bones and the muscles of the human body. 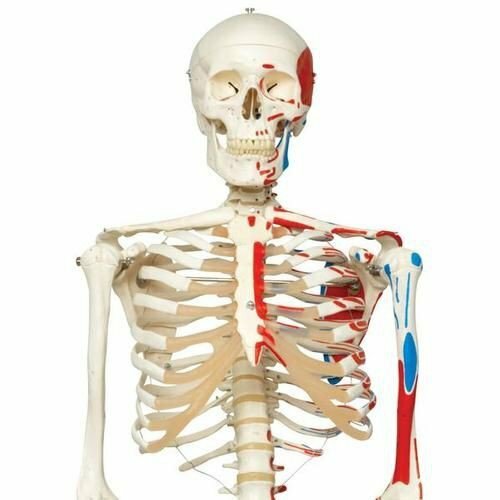 Featuring over 600 hand-numbered anatomical structures, Max helps students learn of specific muscle origins (painted in red) and insertions (painted in blue), as well as bones, fissures, and foramina on the right side. This Human Skeleton Model also features a 3-part assembled skull, individually inserted teeth, and easy-to-remove limbs for specific interaction with individual parts. Max's height and weight are very close to that of an actual average human skeleton with around 200 bones. Available with choice of two different stand options, each with five casters for maneuverability. Vitality Medical also carries other anatomical models, such as the Disarticulated Full Human Skeleton Model and the Physiological Human Skeleton Model. Close to Realistic Weight of Around 200 Bones. Limbs Can Be Removed Quickly and Easily. Top Quality Natural Casting Made in Germany. Final Assembly Carried Out by Hand. Made From a Durable, Unbreakable Synthetic Material. Available On Either Metal Stand with 5 Casters or Metal Hanging Stand with 5 Casters (Painted White).